by Geoffrey Ciani – Over the course of a sixteen month period beginning in June 2009, I conducted a series of surveys that all began with a very simple question: Who are the ten best heavyweights of all time? While contemplating my own list of top heavyweight pugilists, I decided gathering the input of others might help display a more accurate portrayal of what a ‘true’ top 10 list should look like. Now of course this is not an exact science by any means. In fact, quite the opposite, it is an extremely subjective topic that is often skewed by personal bias, differences of opinion, individual tastes and preferences, and most importantly the absence of a universally agreed upon criteria with which to judge past fighters. Even with these inherent obstacles playing their natural role, however, we can still establish some degree of consensus. The guidelines were simple. I had every person who voluntarily participated in each survey provide me with a chronological list of who they considered to be the ten best (heavyweights, middleweights, etc) in boxing history. Ties were not permitted, just a straight-forward list from one to ten. I then used a weighted-points system to assign values to fighters based on where they appeared on each individual’s list. First place votes received 25 points. Second place votes were worth 15 points, third place votes were 12, and fourth and fifth place votes were worth 10 and 8 points respectively. After that, the point differential was constant, with sixth place votes getting 5 points, seventh place votes getting 4, eighth getting 3, ninth place 2, and tenth place 1. The surveys were actually conducted in East Side Boxing’s very own Classic Forum (which incidentally includes a number of extremely knowledgeable individuals when it comes to discussing the rich history of the sweet science). Below is a recap of the results followed by some personal observations. One of the first thing that jumped to my attention was the fact that three active fighters during the span of the surveys ranked within a divisional top 10: Bernard Hopkins, Manny Pacquiao, and Pongsaklek Wonjongkam. A case can certainly be made for each of them, and I think the official tallies illustrate that the strongest case can be made for ‘The Executioner’. Manny Pacquiao is the toughest sell here. To be sure Pacquiao is a sensational fighter whose recent historic run was an absolute marvel to behold. In fact Pacquiao looked nothing short of extraordinary from the period starting with his jump to lightweight against David Diaz, up to and including the brutal beating he administered on Antonio Margarito. It is no coincidence, therefore, that Pacquiao’s ninth place finish amongst featherweights corresponded with a survey that began less than a month after Pacquiao’s exceptional victory over Miguel Cotto. As a result, some of the participants in the survey may have perhaps been infected with a small dose of Pac-Man Fever during that timeframe. Pacquiao’s body of work as a featherweight is definitely on the shallow end of the spectrum. He had just four fights at the weight class. That included a remarkable upset victory against the highly regarded Marco Antonio Barrera, where the Filipino sensation mercilessly battered the Mexican future Hall of Famer. Pac-Man also battled to a draw with Barrera’s future Hall of Fame fellow countryman Juan Manuel Marquez. Pacquiao never actually won a title at feather, although the case can be made that he became the linear champion with the Barrera win. Either way, is four fights in a weight class enough for someone to rank top 10 all time? Apparently it is, at least in this particular survey. In fairness to Pacquiao, it should also be noted that the current weight limit of 126 for the featherweight division was not firmly established until 1920. Prior to that the weight limit varied and had been as low as 114, so perhaps expanding Pacquiao’s body of work down to super bantam would be fair for consideration. Some of the participants in the flyweight poll took issue with Pongsaklek Wonjongkam landing a top 10 spot. Wongjongkam, however, does have an outstanding list of worthy credentials. He was a two-time flyweight world champion, he holds the record for most consecutive title defenses with seventeen, and he also scored the quickest knockout during a title bout in flyweight history when he stopped rival Daisuke Naito in just 34 seconds during their first of four encounters. Interestingly enough, Naito would ultimately be the one to end Wongjongkam’s long reign during their third match-up. But whether you believe Wongjongkam belongs or not, there is no question he has a stellar resume deserving of consideration. In this survey he ultimately got the nod, and deservedly so according to 50% of the participants (myself included). Bernard Hopkins officially placed fifth amongst middleweights. He was included in the top 10 on 39 out of the 45 entries submitted, or almost 87%. The only people finishing ahead of him were true legends of the fight game—Harry Greb, Sugar Ray Robinson, Marvelous Marvin Hagler, and Carlos Monzon. Considering the depth of tradition and history associated with this marquee weight class, finishing fifth is absolutely remarkable! This is one of the instances where universal consensus can and has been established. Hopkins’ twenty middleweight title defenses and overall body of work is quite impressive. In fact, Hopkins even likely enhanced his own legacy within the middleweight rankings through his accomplishments that came afterwards, when he defied Father Time and scored several odds-defying victories as a light heavyweight. Should a boxer’s body of work be limited to the weight class at hand? I say yes, but at the same time I also understand that the impact of a fighter’s overall perception can blur the lines a bit. Hopkins and Pacquiao are examples of fighters who enhanced their own legacies beyond their respective noted divisions in these surveys. Roy Jones Junior, on the other hand, represents the complete opposite! There was a time during his prime where many observers suggested that Roy Jones Junior was perhaps the greatest light heavyweight ever. In the survey Bob Fitzsimmons officially edged Jones out by a mere two points for the 10 spot. Things get somewhat confusing with Jones. After a dominant run at light heavy that included an absolutely amazing display of almost supernatural raw athleticism and reflexes, Jones moved up and outclassed John Ruiz for a portion of the heavyweight crown. This was the pinnacle for Roy. Had he retired right then and there, I have no doubt that Jones would have comfortably landed on the final top 10 tally. Even if he retired after moving back down and recapturing his light weight crown from Antonio Tarver, in what was undoubtedly his most difficult win, his legendary status would have been firmly secured. In most cases, when a boxer hangs around too long, it is not held against him. Fans can overlook an aging Ali being bested by Holmes, or a desperate Louis being battered by Marciano. Not so in the case of Roy. The frequency and sheer brutality of knockouts he has suffered late in his career appear to have had a real negative impact on his overall image and legacy. This is an unusual instance, but when you consider the cases of Pacquiao, Hopkins, and especially Jones in the context of these surveys, I believe ample evidence exists to support the fact that overall perception can tend to sway views both positively and unfavorably. In fairness to Jones, however, there is no shame in just missing the cut in a division with a history as deep and rich as light heavyweight. While not noted in the official top 10 breakdowns, a number of other active boxers did receive mention in the voting process. Those included: Evander Holyfield and Wladimir Klitschko at heavyweight; Jones at light heavy; Jones and James Toney at middleweight; Miguel Cotto, Shane Mosley, and Floyd Mayweather Junior at welterweight; Mosley at lightweight; Marco Antonio Barrera and Erik Morales at featherweight; Rafael Marquez at bantamweight; and Daisuke Naito at flyweight. After the completion of the first survey exploring the heavyweights, my colleague and fellow boxing writer Matt McGrain duly noted, “Watch for the diminishing returns, especially as you go back down past 147”. This proved accurate. As we descended from heavyweight all the way down to flyweight, there were consistently fewer participants along the way. While 80 individuals submitted survey entries for the heavyweight poll, just 16 partook by the time we reached flyweight, and the drop between welterweight and lightweight was rather significant, dropping down to 32 from 43. Part of this is due to the fact that people tend to become less interested as we venture south into the lower weight classes. These divisions just tend to get less attention overall, both presently and in terms of available archive footage. Then there is also the fact that heavyweights have always represented the most celebrated division in professional boxing. It is interesting that even now, in a day and age where interest in heavyweight boxing is arguably at an all time low (at least as far as the US is concerned), participation in the heavyweight poll still generated the most interest by far. For the last several years the Klitschko brothers have dominated the heavyweight landscape. They are both exceptional athletes, each extremely effective at executing a game plan that utilizes his strengths and natural physical advantages. Unfortunately for the brothers Klitschko, there has not been an abundance of talent available to truly challenge them since the retirement of Lennox Lewis. While this is through no fault of theirs, it is something that makes their fights almost dull and predictable to a large extent. Watching a Klitschko brother systematically breakdown an opponent both mentally and physically before stopping him the later rounds has become commonplace these past several years. Amplifying the problem is the fact that with the Klitschkos reigning supreme head and shoulders above the rest, it leaves us in a situation where the two best heavyweights in the world will never square off (and for good reason). This is unfortunate for the fans, but a reality of the current heavyweight predicament. But even with the waning interest in boxing’s most prestigious weight class, excitement still exists for the division, at least in an historical sense, as evidenced in part by the surveys. Not only was the heavyweight edition the one with the greatest number of participants, but strangely enough it also had the lowest number of total boxers who received mention. A total of just 22 different heavyweights were listed in the various orderings of the 80 submissions. This seems to suggest that there is not only a larger amount of enthusiasm and interest pertaining to heavyweight history amongst fans, but there is also a far greater degree of consensus. This point is illustrated when it comes to two boxers in particular: Muhammad Ali and Joe Louis. There were only five first place votes that did not go to either of these two men. Ali received 52 first place votes and 20 second place votes; Louis received 23 first place votes and 50 for second. The near mirror image of these numbers illustrated that almost every person surveyed agreed that Ali and Louis were the two best, with the majority preferring Ali. According to this survey, Muhammad Ali is indeed The Greatest. The term “Pound-for-Pound” was originally used as a means by which to compare boxers from different weight classes. 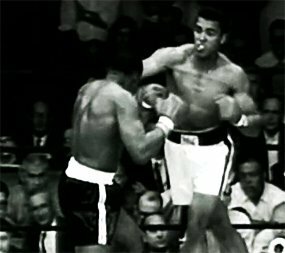 For instance, if the great Sugar Ray Robinson and Muhammad Ali were both the same size, who would win? In theory this is simple straightforward stuff, but in practice it becomes far more complicated and confusing. After all, it is difficult enough to speculate what might happen if fighters from different eras in the same weight class theoretically squared off. When talking about pugilists from different eras and different weight classes come into play, there is a great deal of interpretation involved. For example, should a fighter like Marvin Hagler be penalized for dominating the same weight class throughout his career? Or should a guy like Sugar Ray Leonard who won titles in multiple weight classes be given the edge? Of course this might be a poor example due to the fact Leonard officially beat Hagler, but that represents an entirely different topic for discussion that we will save for another day. But the question still remains: What does P4P mean? In terms of this survey, Ray Robinson predictably finished first, and not without good reason. In the P4P poll Robinson secured 34 first place votes out of a total of 41 official submissions. He also came in first overall in the welterweight survey, and fourth overall in the middleweight survey. The fact that Robinson finished in the top 5 for two different weight classes in the surveys, and that he also finished first in the P4P edition, speaks volumes about how this legendary icon is perceived by boxing fans. As impressive as Ray fared in the surveys, however, a case can be made that Henry Armstrong performed even better! Armstrong finished second overall in the featherweight survey, he finished fifth as a lightweight, and then he finished third as far as welterweights go. He also placed third overall in the P4P poll. Given the fact that Armstrong finished top 5 in three divisions, whereas Robinson finished top 5 in just two, certainly provides some interesting food for thought. It actually brings us back to the Hagler-Leonard situation. Should Hagler be penalized for spending his entire career at middleweight? Or should Leonard receive a bonus for exhibiting dominance throughout multiple weight classes? In the strictest of terms I do not believe Hagler should suffer as a result of his dominance in a single weight class, but I also understand the appeal of seeing a boxer conquer multiple divisions. In essence, succeeding in multiple weight classes acts almost as an illustration of the very concept at hand, but it simultaneously can be something that restricts our overall perception when it comes to truly great champions like Marvelous Marvin Hagler. At the end of the day, it appears that Ray Ronbinson may well have secured his spot as the ‘All Time P4P King’ of all time, because regardless of what happens in the future, Robinson simply personifies the standard of excellence in professional prize fighting. In conclusion I would like to thank everyone who participated in this series of surveys, especially those who partook in all nine. Without them none of these lists would have been possible.